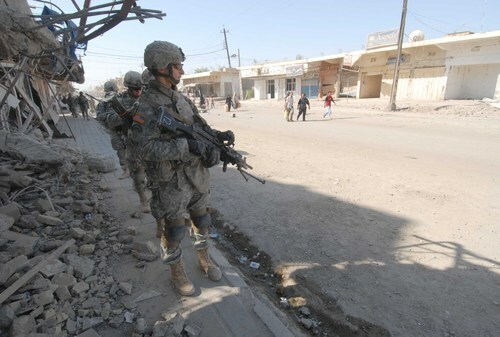 The following two images are of Chaos Company soldiers patrolling in East Baqubah. I arrived here this weekend. Relatively speaking, it is good to be here. 1Lt. John Omohundro, 1st Battalion, 38th Infantry Regiment’s adjutant, picked me up and took me to my quarters. I was amazed; it was the first time I had actually been in living quarters where there was a decent floor and a mattress to sleep on. I thought I was at a Hilton. “We’ve done a great deal to improve conditions for the soldiers,” said Maj. Jody Miller, the battalion’s executive officer. “Extra air conditioning has been installed, and we’ve put a lot of gravel down to control the ‘moon dust’ around here. Sometime in the near future, the soldiers will have Internet and telephone access in their living areas. “Moon dust” is the talcum powder-like dust that flies up in the slightest breeze. It plays hell with sinuses and electronic equipment. Putting gravel over it significantly reduces the dust. 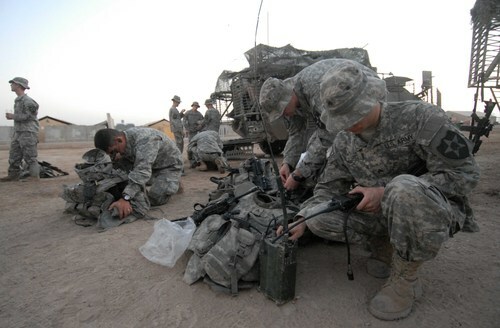 1st Battalion, 38th Infantry Regiment is currently attached to 3rd Brigade, 1st Cavalry Division at FOB (Forward Operating Base) Warhorse, which is about 60 miles north and east of Baghdad. The FOB sits near the Tigris River, which divides the city of Baqubah. Its population is about 200,000. Shias comprise 15 percent of the population; Sunnis comprise 83 percent of the population; Kurds and “others” comprise the final 2 percent. The battalion’s area of operations is the western half of the city. In the month that it has been here, the battalion has made significant progress in the area. “We’ve been successful in maintaining security and beginning to rebuild the city’s infrastructure,” continued Miller. That rebuilding process started with the removal of hundreds of IEDs and booby traps. 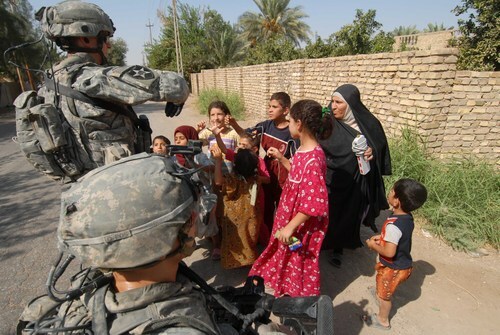 Once that was done, the battalion worked to ensure that food supplies from Baghdad were successful in arriving in Baqubah. “We’ve also been successful in restoring electricity and fuel to the area,” said Miller. “ Furthermore, we’ve had success in putting in a water pumping station and chlorine to give the folks here clean water,” he added. While pleased with the battalion’s efforts, Miller said that there is still a great deal of work to do. “We just want to set the conditions for a peaceful Ramadan, the Muslims holy month,” he added. Over the past three-and-a-half weeks, I have had the opportunity to reflect on what President Bush’s “surge” of combat forces in Iraq means. His reasons for the “surge” strike me as doing too much, too late. Former Secretary of Defense Donald Rumsfeld’s idea of fighting this war on the cheap has cost this country dearly. His refusal to deploy an adequate number of troops to occupy Iraq has ultimately led to the creation of the hydra-headed insurgency we face today. Had Rumsfeld prosecuted this war as though he wanted to win it, we would not be involved with the “surge” and the combat deaths that have come with it. To be sure, the surge has been successful. The sectarian violence between various Shia and Sunni factions has been mitigated. 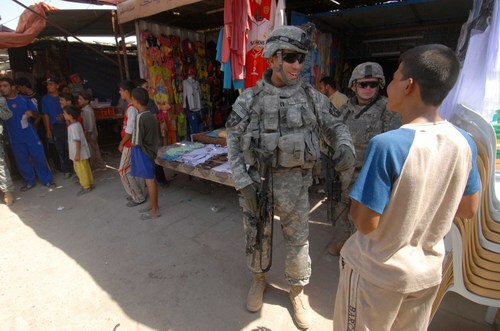 There is increased cooperation between Iraqis and American soldiers. On several occasions, I have watched and listened as Iraqi citizens have provided information as to where explosives are or who an insurgent is. But that’s just one level of this war. On another level – the political level - one cannot ignore the mess the Iraqi government is in. All reports indicate that the government of Prime Minister Nouri al Maliki is nowhere near to being able to function productively. It seems criminally incompetent. Is the United States of America supposed to continue to pay for Iraqi political impotence with our treasure and blood? The answer to this question can be found in another question. The language may be rough, but the message I’ve heard repeatedly from soldiers while here is clear: It’s time for the Iraqi government to take responsibility for its country and its people. And that will happen only when our troops return home. Here are more photos from Ranger Photographer J.M. Simpson, currently embedded in Iraq with Strykers from Fort Lewis. I found myself on a road headed north between a hamlet called El Hessiwayah and Shak Hamad Village not far from the Tigris River. To my left was SSgt. Justin Evaristo, a street savvy kid who has seen his fair share of combat. “Now when we get past this wall on the right, watch yourself,” he said as we slowed down. “Snipers from across the river like to take potshots at us as we move down the road,” he added. I knew this to be true. Earlier in the morning, Evaristo, Cpl. Sean Spinks, Pfc. Nicholas Vazquez and I had investigated a dilapidated pump house in the town of El Hessiwayah. When we did, Spinks had mentioned the same thing. “It’s not hard for a sniper to get a bead on you from across the river,” he said. “It’s not that far of a shot,” he added as I drifted behind the wall of another out building. But out here on the road … in what amounted to a sniper’s shooting gallery … we were looking for an IED, or improvised explosive device. I hoped a sniper wasn’t looking at us. To find the IED meant some soldiers had to slog through tall grass between taller palm date trees while others patrolled down both sides of the road. Wary of the sniper, I headed for the tall grass. Better to suffer the effects of heat stroke than those of a bullet, I figured. Anyway, not long after getting into the tall grass, we began to pick up on signs that someone had been here. Little trails, matted down areas of grass, and bits of copper wire began to appear. The evidence of someone having been here was clear. And I began to wonder what the hell were the insurgents thinking in leaving such signs behind. And then we caught a break; Cpl. Curtis Pitman found a good-sized blue spool round with what looked like several hundred yards of thin copper wire. I walked over and took a look at it and again found myself wondering why it had been found so easily. I turned and walked back toward SSgt. Francisco Martinez as he plowed through the tall grass toward the road. I thought I would give him a hand up. In-between us at our feet, little bits of blue metal peeked out from under a small dirt mound. “So, what do you think, John?” he asked. Martinez laughed as we both edged away from the IED. Some soldiers cordoned off the area; Capt. Mike Williams, commander, Alpha Company, 4th Battalion, 9th Infantry Regiment, called EOD (explosive ordnance detachment) and waited. Known as the “Joker Element,” EOD’s job was to blow the three 130mm mortar shells that made up the IED to bits. In a while, the Joker Element showed up … grumpy as hell … and planted a good-sized charge that reduced the IED to little pieces. “We did good today, you know?” said Martinez with a smile. “Hey John, want to come out with us when we blow something up really big?” he asked as he walked away. 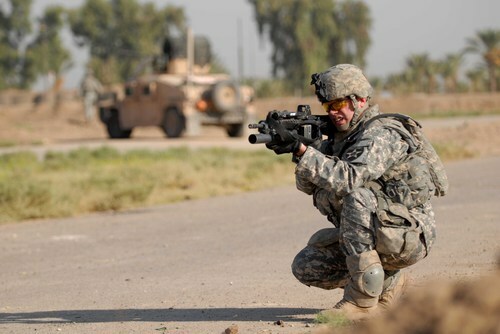 Someone recently commented to me that by coming here to Iraq and embedding with the soldiers of 4th Stryker Brigade Combat Team (SBCT), 2nd Infantry Division, I would become a better man. 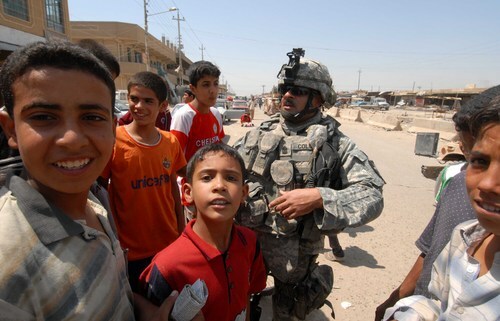 My experiences in Iraq (2005, 2006 and now 2007) as an embedded photojournalist with units from Fort Lewis, WA, have instilled in me a greater appreciation of what I have been blessed with. Indeed, my experiences have saddened me, angered me, hurt me and humbled me. But I do not believe they have made me a better man. For example, when I see poor Iraqi children I am reminded of what I had as a child in comparison to what these children don’t have. 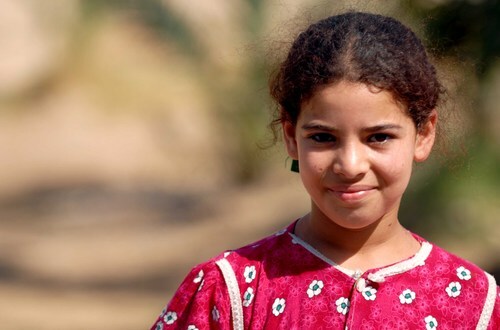 Moreover, I as a father I draw a comparison between what my wife and I have been able to provide for our children to what little Iraqi parents cannot provide for theirs. I didn’t have to come here to Iraq to feel that sense of appreciation. I could have just as easily driven through the poorer parts of Lakewood or Tacoma or most of Tillicum and come away with the same sense of appreciation. Another example comes to mind when I think of eating monotonous food, enduring suffocating heat, living in dirty and dusty quarters, sitting for hours in dimly lit and over air conditioned rooms, using cramped and smelly latrines, putting up with sand fleas, wearing body armor for hours on end, and keeping in check the fear that comes with facing IEDs and snipers. These experiences make me hot, angry, sad, and sometimes just darn mean. They also make me appreciate home all that more. For example, I did not have to come here to appreciate the fact that my wife keeps our home neat and clean, that there is good food to eat and clean clothes to wear, and I that I am safe. I think I speak for many Americans when I say that I am disgusted with our President who has been so stubbornly unwilling to let go of this mess of a war. But I did not have to come here to see just how messed up the President’s policies are. I can read the newspapers and magazines and appreciate what others have to say before making up my own mind. Being present at the death of an American soldier has not made me a better man. 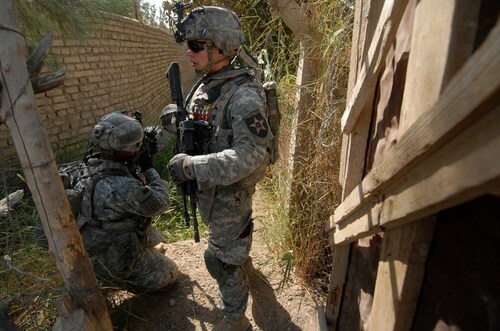 That soldier’s passing only made me sad and angry … and appreciative that I am still alive. The fact that over 3,700 lives have been lost and over 27,000 have been wounded in this war makes me keenly aware not only of its human cost … these grim facts make me aware that I could be one of those number. Having been near the receiving end of an IED – the most lethal weapon used against our soldiers - I know. There is not one among those who grieve for the loss of their soldier, Marine, sailor, airman or civilian contractor who would not give up everything to hold their son or daughter, their husband or wife, their brother or sister, in their arms again. Are they better for this experience? I can only wonder what I would do if I were in their position, and I am more than humbled by my deepest appreciation of the fact that I have been spared this ordeal. Some will argue that life is hard, and it is the challenges we face in this life that make us stronger and smarter and wiser. But facing the challenges I have in Iraq … or in life … does not necessarily mean that I am better than you. War is a hard, mean and dirty business. It involves death and destruction. There is no way around that. 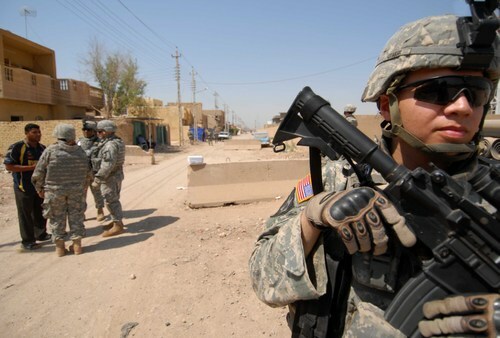 And going through a small part of the hell that is this war in Iraq has not made me a better man. Only more appreciative of the life I’ve got. The mission was simple: Drive into Husseiniyah, surround a house and search it for weapons and explosives. And a 60-pound Belgium Malenois named Kira would lead the assault. 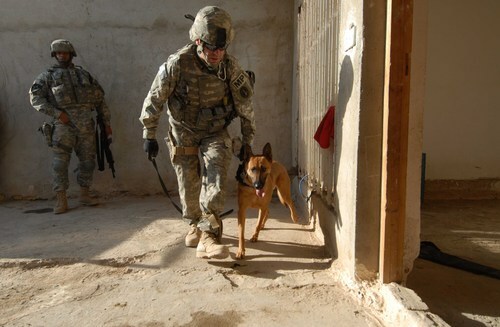 As soon as the five armored Humvees rolled to a stop, the dog and her handler, Sgt. 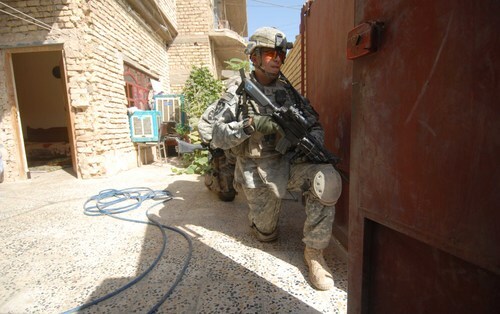 Joshua Sharpe, 4th Brigade Stryker Combat Team (SBCT), 2nd Infantry Division, hit the ground and headed for the house. This mission involved joint coordination between Assault Company, 2nd Battalion, 12th Field Artillery Regiment, 38th Engineer Company and Kira. “If there is something here, she will find it,” commented Sharpe as he waited for the house to be cleared. “I can’t begin to tell you how valuable this dog is to us; she can find anything,” he added. With the house cleared of people, Sharpe and Kira entered the house and began to search. “Come on girl, let’s look over here,” coaxed Sharpe, as Kira headed toward the kitchen were there were a couple of chickens hiding. “We’ll get to the chickens soon enough,” he said with a chuckle. As Kira worked, other soldiers from the regiment kept sharp eyes on the house, its occupants and the surrounding area. “You never know whether or not a sniper is watching us,” said SFC Angel Colon as he sighed through is scope. Part of the operation had been designed to catch this guy at the house. He was, however, nowhere to be found. “He’s been here the last two times we’ve been here,” commented Capt. Matthew May, executive officer, Assault Company, 2nd Battalion, 12th Field Artillery Regiment. “We know he’s got weapons and explosives, and I was hoping we would catch him with his stuff today,” he added. As Sharpe and Kira took care of the house and the immediate grounds, Spc. 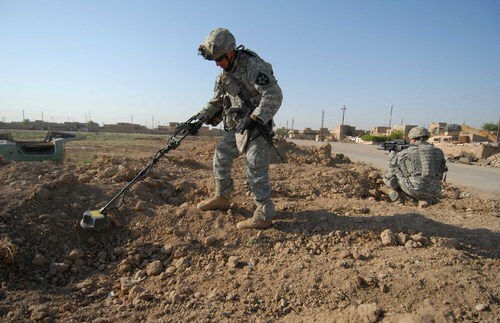 Erik Marenco, 38th Engineer Company, used a mine sweeper/metal detector to check the fields next to and across the street from the house. “I’m getting some readings,” said Marenco as he moved slowly and steadily through a vegetable garden. The detector clicked every so often. Watching Marenco’s back was Sgt. Joshua Brown, 38th Engineer Company. “But it’s nothing big; just a bunch of pieces of metal,” said Marenco as he moved toward a small field. On the roof, May and Colon questioned a man about the suspect’s whereabouts. That man said that the suspect in question had left for Basra. Along with the man on the roof were three boys, one of whom looked to be about 16 years old and was lying belly down on a bed suffering from what looked like shrapnel wounds to his back and buttocks. “He says he was shot by the militia while riding in a taxi,” said May with a degree of skepticism. “It’s more likely that he was wounded when the IED he and some others were planting went off on them,” he added. There have been clashes between various Shia groups in Husseiniyah. Not too long ago, one group destroyed the mosque of the other group. “He’d like us to believe that he was a part of the fighting between these groups,” said Colon. “But look at the wounds; he got those riding in a taxi?” he asked. Colon had a point; they did not look like gunshot wounds. Kira finished her search, and Marenco finished his sweep of the surrounding yard. It looked as though the man and his munitions had gotten away. “It’s still a good mission,” said Colon. “He knows we’re looking for him, and maybe he’ll decide not to come back here after all,” he added. 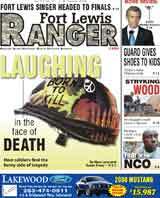 More photos from Fort Lewis Journalist J.M. Simpson. He is currently in Iraq with 4th Brigade Strykers from Fort Lewis. I had the opportunity yesterday to go out on a mission with 1st Platoon, Alpha Company, 2nd Battalion, 12th Field Artillery Regiment, into the city of Husseiniyah. I have since written an article about this mission, and you will be able to read it in tomorrow's issue of the Fort Lewis Ranger Newspaper (Sept. 6). But there are a couple of comments I would like to make. The city of Husseiniyah is comprised of approximately 650,000 Shias. And yet it covers an area of land about half the size of Tacoma. That’s a lot of folks in a small area. And speaking of someone with a small perspective, let me introduce you to the mayor of the city. He is a study in obfuscation. The man could not give a straight answer about his city’s water problems if his soul depended upon it. And we didn’t dare ask about any other municipal problems. Be that as it may, it would seem clear to any right-minded individual that ensuring an adequate water supply for one’s city would be, oh, priority number one. Can you imagine the uproar if Lakewood’s mayor Claudia Thomas decided to not put the public’s basic needs at the top of her list? Why Pad Finnegan and his friends would go nuts – if they weren’t already. Anyway, the mayor of Husseiniyah continued to talk around the questions put to him by American soldiers who wanted to help him. In fact, the mayor sort of reminded me of how President Bush and his minions talk around the war in Iraq. All talk, no real good answers. And then the mayor would every-so-often run his hand through his not-so-well cut hair. That move made me think of presidential candidate John Edwards – one of the Democratic party’s usual suspects who thinks he could do a better job than President Bush has done in Iraq - and his finely coiffed and expensively cut hair. Imagine the mayor of Husseiniyah and President (?) John Edwards together for a photo op. It’s too much! Of course, the Secret Service would insist that the mayor remove the Colt .45 he had stuck in his belt. 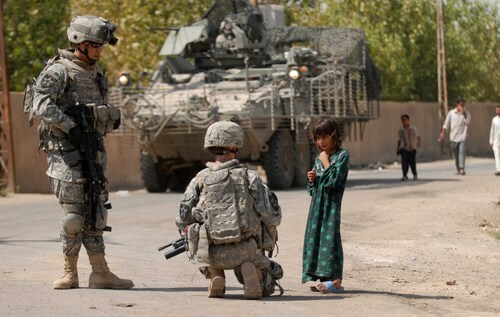 All kidding aside, the soldiers here work very hard to promote values that you embody. Hard work; pride in one’s community; love of one’s family; you know what I mean. And that is to say nothing of their combat mission. It is not easy.